Forty has a special significance in many cultures. The big 4-0 is often celebrated as a special milestone, accompanied by an extra-special something to mark the day – an all-out party, a long-planned vacation, some bespoke jewellery, or a special wristwatch. Forty is a benchmark of deep transformation. Moses was sent to Mount Sinai for 40 days and nights. Forty years can signify a generation; forty can represent a period of purification and clarification. Forty is important, forty is spectacular. 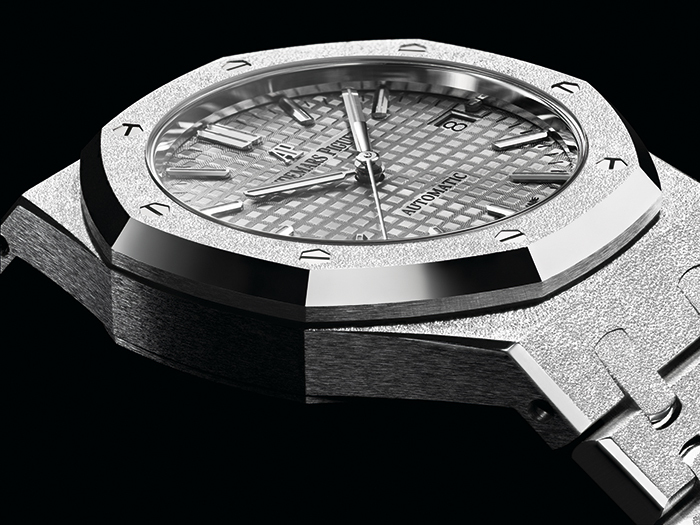 For Audemars Piguet, they are celebrating 40 years of the women’s Royal Oak with a wonderful improvement on the iconic wristwatch. 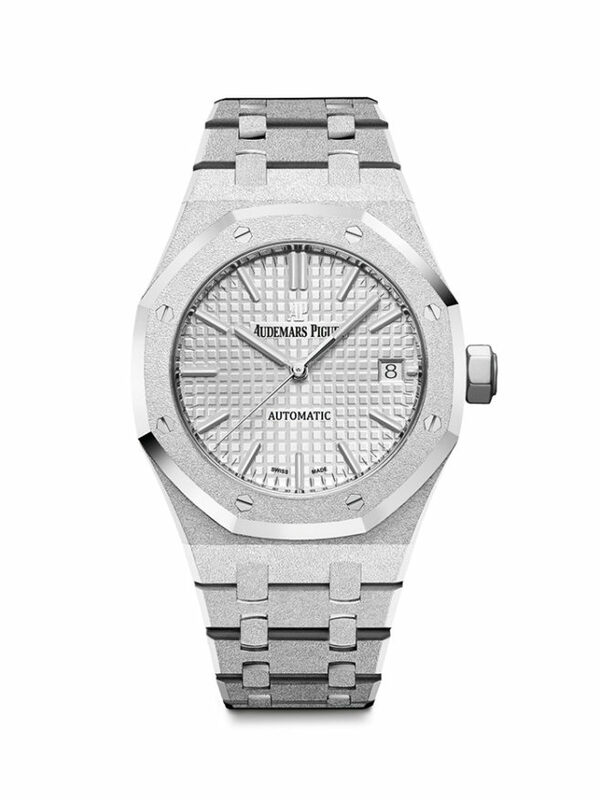 To give you a little background, the Royal Oak was introduced in 1972 with Gerald Genta’s initial model. Gorgeous that this men’s watch was, it came as no surprise that the ladies wanted one for themselves. Enter Jacqueline Dimier in 1967, who reimagined the watch for the ladies. Beauty withstands the test of time, but even the beautiful can do with an upgrade every so often. 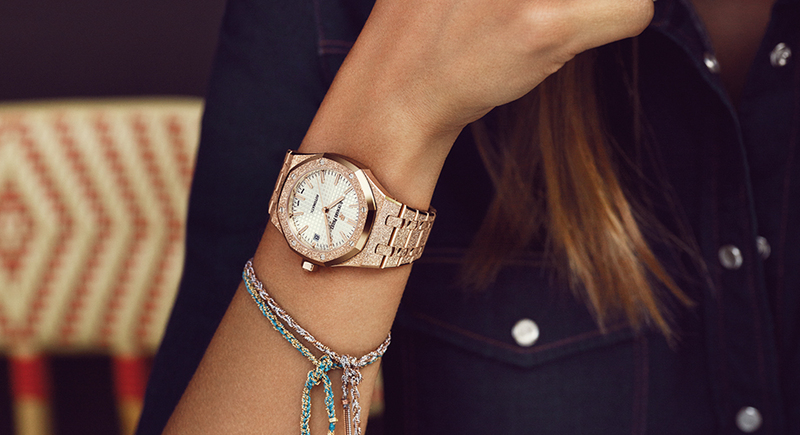 The latest artisan to lend her hand to the Royal Oak is Carolina Bucci, an Italian jewellery designer. She was born in Florence to a family of jewelers, and started her own line in 2003. Surely the beauty of Florence influenced her style and design aesthetic. How can you not be inspired when surrounded by museums, galleries, and architecture, all bursting with rich history and culture? The influence of the family is important too, with generations of jewelers to watch and see and learn from. Jewellery and beauty, it is in the blood. There is a craftsmanship process that is uniquely identified with Florence, and, indeed, takes its name from the city – the Florentine finish. This finish is unique because it is a version of an ancient gold hammering technique that creates an alluring surface finishing. A hammer is used to dent or leave an imprint on a piece of metal. Meticulous attention is needed to produce an item that is enhanced in a uniform manner. The gentle hand leaves imprints of the same depth and pattern. A deviation of the even the slightest force or angle could render the piece unworthy. How the tool is held also determines the type of finish – a slighter angle begets a lighter finish, with shallower marks. There is a gentle balance needed to achieve a uniform look and feel while still maintaining the structural integrity of the piece. Miss Bucci actually uses a diamond-tipped hammer for her work. Perhaps the facets on the diamond add to the sparkle created in the finished product. But it is also impressive to think that she can use the hardest naturally-occurring substance on the earth, not to destroy another element, in this case, gold, but to enhance it. 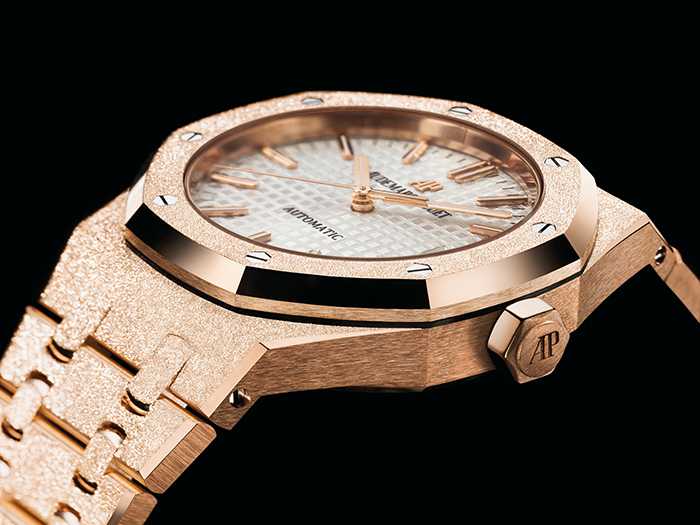 The collaboration between Miss Bucci and Audemars Piguet stemmed from a unique link between the exquisite workmanship of the Florentine finish used by Miss Bucci’s workshops and the brushed and polished work of the Royal Oak’s case and bracelet perfected by the AP craftsmen. Miss Bucci’s work had been focused on smaller pieces, initially, but she began using the technique on larger pieces like cuffs and pendants. She highlighted the Florentine finish itself rather than any other part of the design. 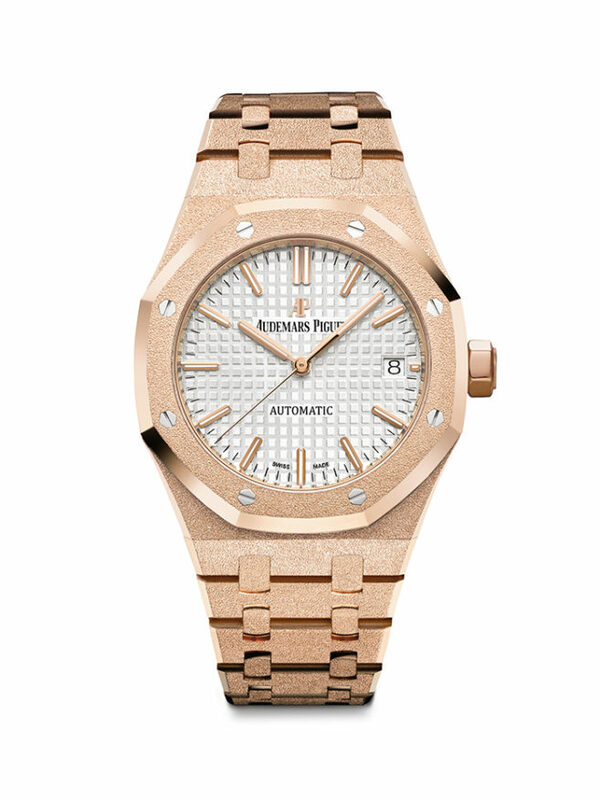 There are four Royal Oak Frosted Gold wristwatches to choose from, each one beautiful. It comes to preference of color, size, and movement. 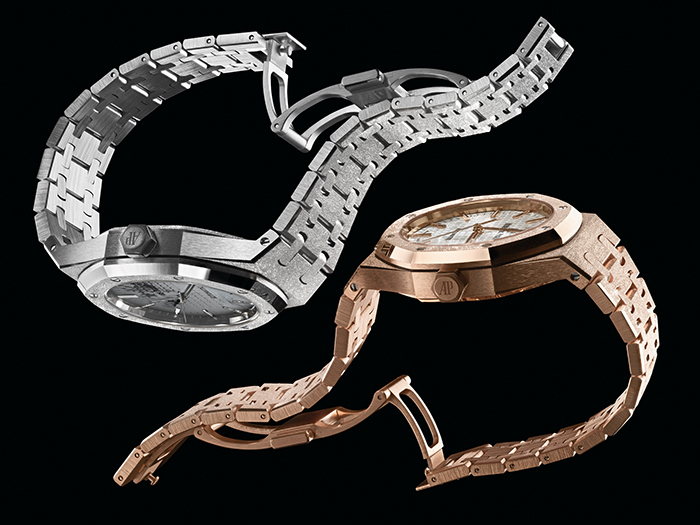 Let’s look at the differences in movement first – self-winding and quartz. A self-winding movement is a mechanical movement, meaning the watch harnesses the energy through the natural motion of the person wearing the watch. The more spring in your step, or swing in your arm, the more power ‘sent’ to your watch. Some purists prefer the self-winding calibres, and have watch winders at home to keep their watches running even when they’ve chosen to wear a different watch for a day or two. The watch winder keeps the energy steady, thus no need to adjust the time after the couple days’ hiatus. A quartz movement uses a battery – no need to worry about adjusting the time when you swapped out one watch for another for a couple days. Easier and more convenient for some. 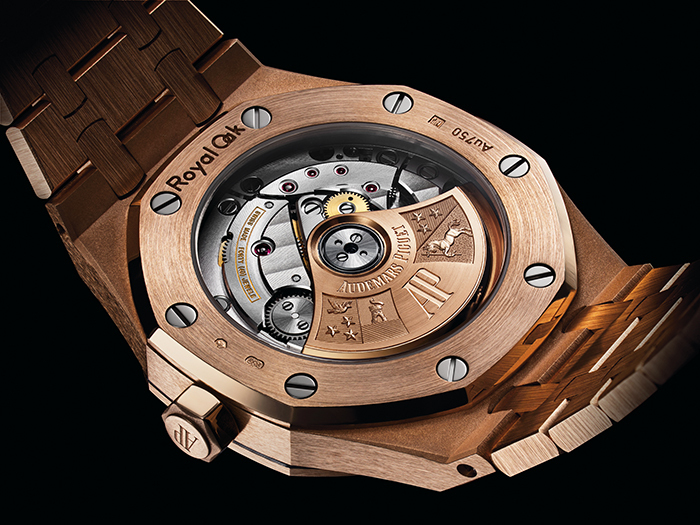 The self-winding movements, Calibre 3120, can be found in the pink gold 37mm watch (Ref. 15454OR.GG.1259OR.01) and in the white gold 37mm watch (Ref. 15454BC.GG.1259BC.01). These watches have 60-hour power reserves and are water resistant to 50 meters. The silver-toned dial has the Grande Tapisserie pattern with hour markers. The watch functions include the hours, minutes, centre seconds, and a date window at the 3 o’clock. The quartz movements, Calibre 2713, can be found in the pink gold 33mm watch (Ref. 67653OR.GG.1263OR.01) and in the white gold 33mm watch (Ref. 67653BC.GG.1263BC.01). These watches are also water resistant to 50 meters, and have the Grande Tapisserie pattern with hour markers. While these watches have the hours, minutes, and a date window (also at the 3 o’clock), they do not have the seconds hand. 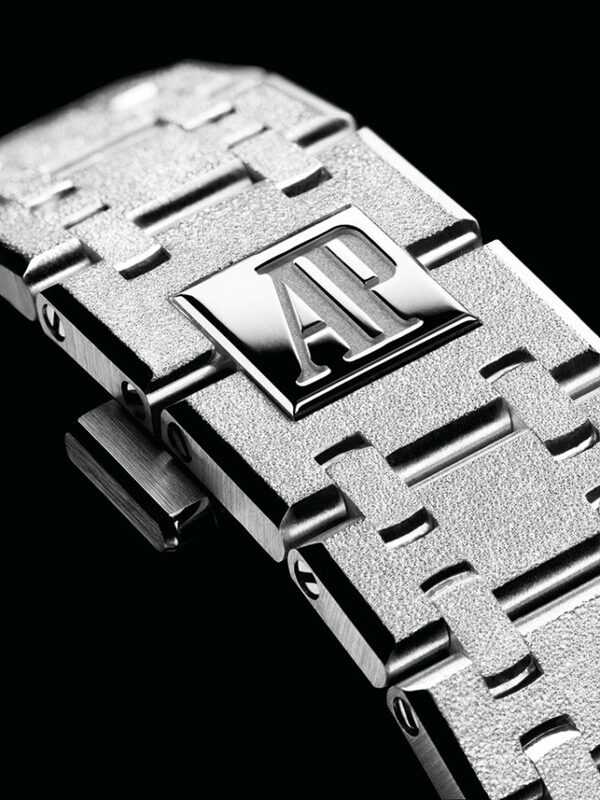 All four versions have the distinctive and coveted bracelet, with the AP folding clasp, that sits so perfectly on the wrist. And all four versions sparkle brilliantly with the Florentine finish.